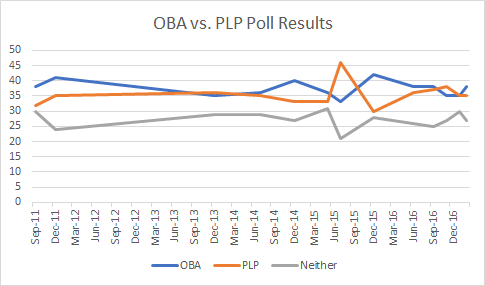 The recent poll results suggest an uptick in OBA support, though it comes in the fashion of undecideds becoming more certain rather than any sort of conversion from the PLP support base. This poll was conducted between February 7th and 9th, before former Premier Brown’s businesses were raided and the government launched a lawsuit against the Lahey Clinic. It was also before excerpts of emails were published in the paper that allege there was a conspiracy to drive up health care costs. That won’t bode well politically for the PLP because a former PLP Premier is implicated. Worst of all, rising health care costs have impacted every Bermudian and this weighs on that important voter question “how does this impact me?”. Before this poll, we surmised the PLP had lost the momentum they’d built up thanks to the Genevieve-Tweed crusade. Now it looks like they may not just lose their momentum, but re-energize OBA supporters while disillusioning their own. If a poll were held today, would we see a decline in PLP support and a rise in undecideds or is it possible that we’d also see a decline in PLP support, a decline in undecideds and a corresponding rise in OBA support? This is quite a hole to dig out of, though the same would have been said of the OBA back in November when police pulled out the pepper spray. It certainly could still be recovered from, however the timing is pretty bad. The sad truth is that the PLP has spent far too much time trying to be “not the OBA” and not enough time being a credible alternative. They were elected to govern for many years to provide opportunity to those who were disadvantaged and yet increasingly it doesn’t look like that really happened. Only a select few seem to have prospered. When people look deep down and ask themselves “how does this impact me?” associating rising health insurance costs with the PLP is a pretty horrible combination. What have they really done to demonstrate they’ve learned from being voted out? Thus the PLP’s prospects aren’t looking very good. Things are already starting to ramp up for the America’s Cup. Jobs, the big headline item, are being created. Money is starting to flow. It will mostly all be temporary and will dry up come July but the hype, euphoria and joy of having money in one’s pocket won’t be so quick to fade. It looks like this time around the OBA won’t need to make pie in the sky promises of being a new party that promotes good governance that they have no intention of fulfilling. It seems quite likely that we’ll see an election called for mid to late July if things stay the course. That would be the most likely time for the OBA to capitalize on their momentum, broken promises or not. This entry was posted in Politics and tagged OBA, PLP, Poll, Strategy by DenisPitcher. Bookmark the permalink.